It is evening, a mother weeps bitterly because her only son is dead. She walks slowly in the funeral procession among a large crowd of mourners that have joined her. Despite the crowd around her, she feels alone and numb to her surroundings. She is a widow and now she has no son. As she walks behind her son’s remains she is inconsolable. Her eyes are blinded with tears so she does not see Him looking at her from nearby. She does not see Him approaching her. Among the sounds of mourning and the funeral dirge she hears Him say, in a still small voice, “Stop crying.” These words are delivered with such empathy, gentleness, love, and compassion that she takes immediate notice and locates the speaker – it is Jesus. Then He steps in front of her son’s open casket, touches it and says, “Young man, I say to you, Arise.” The son that was dead sits up and begins to speak. Oh what joy! The mother’s mourning has now turned to gladness, her sorrow is gone. Her son is alive. 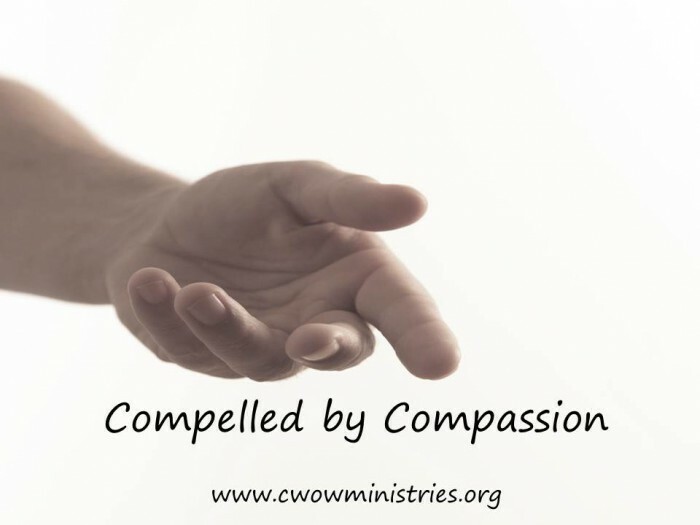 Jesus’ compassion for the woman is what caused Him to act. Jesus was compelled by compassion to raise her son from the dead. Who are you compelled to help? We at CWOW Outreach Ministries pray that this mindset be in you that was also in Christ Jesus. Take on the compassionate mindset and begin to see, feel, and act to the glory of God.